It has long been suggested that if a three-dimensional object casts a two-dimensional shadow, then a four-dimensional object would cast a three-dimensional shadow. The logic of this however, only works if all 2D objects were shadows to begin with. Ever wonder if it were the other way round? What if direction was an optical illusion? 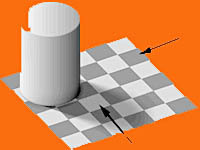 What if all 3D objects were just shadows propelled from a 2D realm? Then, instead of higher dimensions ejecting downwards, it would be the lower or flatter dimensions bursting outwards. The 4D plane would be a shadow of the 3D world. Light wouldn't be hurled out by the sun; light would be falling into the sun.